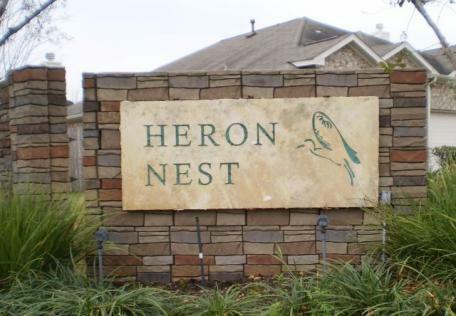 Heron Nest is located in Houston Texas off of Sam Houston Parkway and Gessner Rd. The community was developed and built in 2005 with 315 single family homes. The developer annexed a section of Windfern into Heron Nest which created five entrances into one subdivision. The developer did not turn the streets over to Harris County but rather decided to convey them to the Association. The Board of Directors designed a five year plan to develop a solution to the overwhelming amount of traffic using their community as a quick route from Gessner to Windfern. The first step was to install speed humps at specific locations to reduce the rate of speed in the community. The developer did not install sidewalks and adults and children are forced to use the streets when walking through the community. The second step was implemented in 2011 and completed in 2012. The Board closed two of the five entrances to the community. Although this caused a small inconvenience to some residents the long term goal was to reduce the amount of non-resident traffic entering Gessner and exiting out those streets. Heron Nest property owners were promised amenities by the developer when they were purchasing their homes. This is not an uncommon practice to get eager homebuyers to move in a new community with the hopes of having a pool or playground for their children to enjoy. Unfortunately the promises were empty and members soon discovered they were left with an empty lot that consisted of no luxury pool or playground. We are proud to announce that after five years of planning, saving and sacrifice, the Board of Directors has contracted with CMC Construction to install a new park. It will consist of a playground structure for ages 2 to 12 years old and walk way around the entire park. There will be a splash pad with several water features to keep the children entertained and cool from the summer heat. The covered pavilion will have two picnic tables as well as two barbecue pits to cook out with the family. There will also be a refrigerated drinking fountain. The park grand opening is planned for December. This year, the Association held the first ever celebrated NNO for Heron Nest. There was a representative from the local police department and fire station. Food was provided from James Coney Island and Domino’s Pizza. Funtastic Clowns was there with face painting for all the children. The evening ended with a drawing for five gift cards to various establishments. It was a pleasure to see the community member’s expressions of joy at the event. Last but not least a huge thank you to those Board Members who volunteer their time. Michael Benson (President), Nefi Hernandez (Vice President), Fabian Villanueva (Treasurer), Mathew Bonasera (Secretary) and Steven Tran (Director).